From exquisite Cantonese cuisine at Hai Tien Lo to traditional Japanese cuisine at Keyaki to seven distinct regional open kitchens at the Edge, Pan Pacific Singapore is itself one of the most vibrant dining destination in Singapore with 6 restaurants and bars in the hotel! Besides dining at these restaurants and bars (hotel guests enjoy 20% savings for dinner), Pacific Club guests can also enjoy champagne breakfast at Pacific Club or buffet breakfast at Edge, from 6am to 10.30am or in-room dining breakfast at their leisure. We were at the Pacific Club for sunset cocktails and canapés in the evening (available from 6pm to 8pm). I loved the Pacific Club’s food selection – our evening canapes included Mac & Cheese, Duck Spring Rolls and selection of sushi and tasty desserts. Afternoon tea is also served daily at the Pacific Club from 3pm to 5pm so Pacific Club guests need not worry about going hungry. Pacific Club guests also enjoy complimentary soft drinks and snacks from their in-room minibar too! Another awesome perk of being a Pacific Club guests is the breathtaking views of the Singapore skyline, Marina Bay and even the South China Sea through the Pacific Club’s floor to ceiling windows and you get a 360 degree view as you walk around the Club – yes the Club is very big and covers one whole floor at level 38. 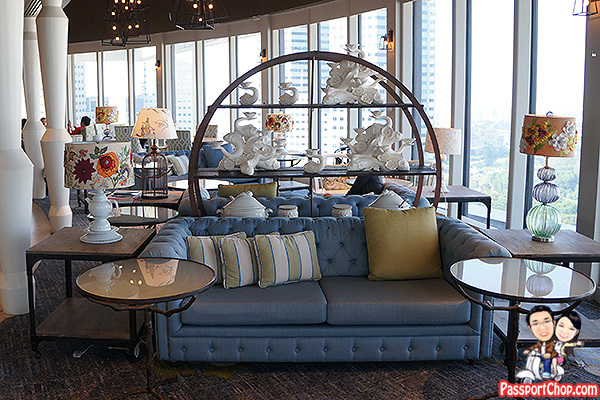 The decor and interior design of the Club is just so beautiful – comfortable sofas and exquisite lamps and tablepieces. The breakfast buffet served at the Edge is just as amazing- besides the usual bread station (croissants, muffins, pastries) and egg station (omelettes, scrambled eggs etc. 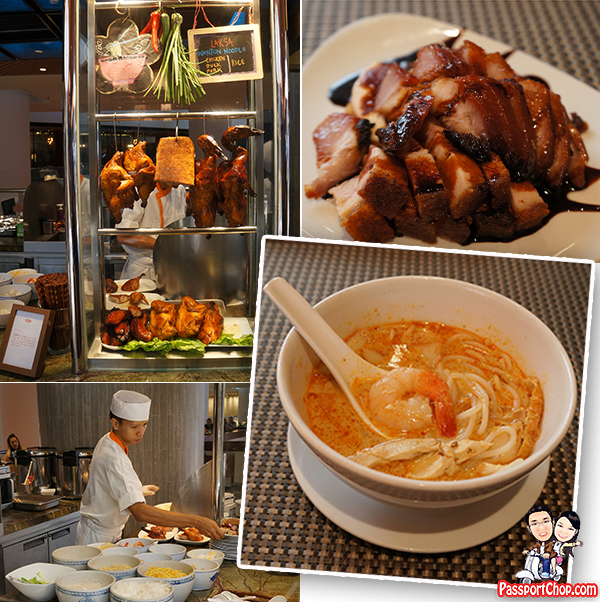 ), there are a lot more other stations – dim sum, local delights (nasi lemak, soup noodles, fried noodles, porridge, congee). The dessert station is quite impressive too – Western and Asian selections – from waffles, pancakes to tutu kueh and many other types of kueh and even ice-cream! 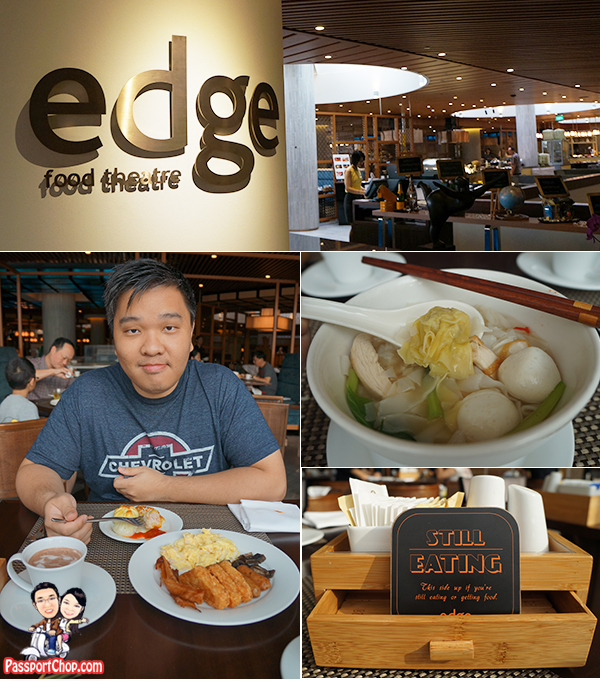 Based on variety and taste, I give the entire breakfast buffet experience at the Edge 5 stars! Just remember to keep your “Still Eating” sign up to enjoy your breakfast. 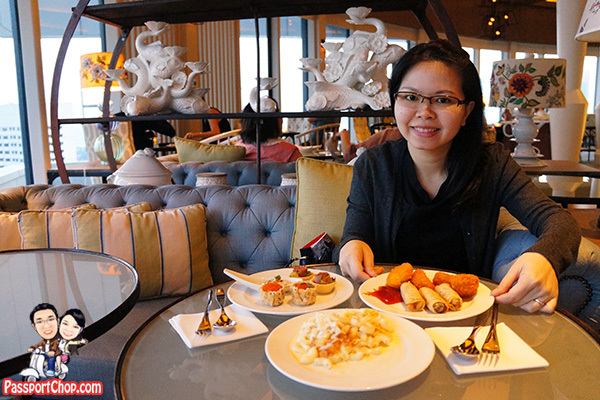 There are lots of Sunday champagne brunch buffets now in Singapore. The Edge at Pan Pacific Singapore differentiates itself as one of the longest champagne brunches ever in Singapore – four-hour long brunch. 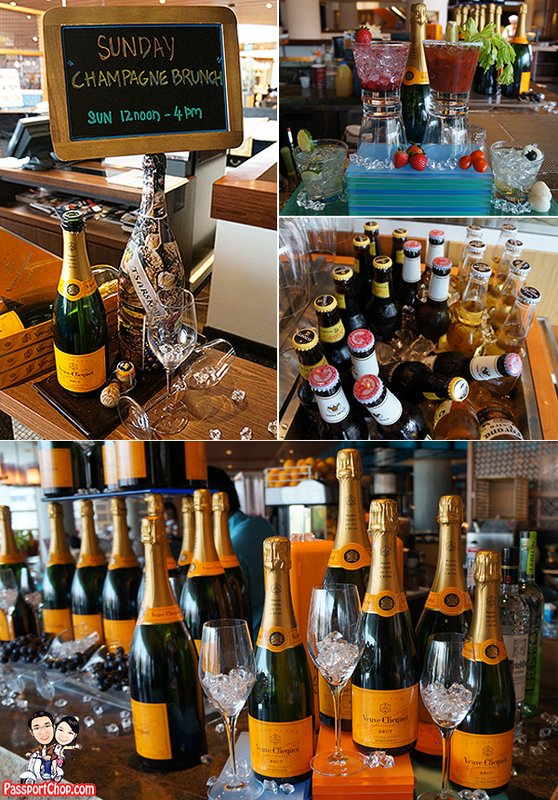 The Edge’s champagne brunch buffet is only available on Sundays from 12pm to 4pm. You will of course enjoy unlimited Veuve Clicquot champagne, wines, beers and cocktails with this dining experience so don’t drink yourself too full as there are lots of food stations covering more than ten different cuisines waiting for you as part of the Edge’s Sunday champagne brunch buffet. With live stations, a two-metre cheese and bread table, gluten-free desserts, and more than ten different cuisines, Sunday brunch will never be the same for hearty-eaters. 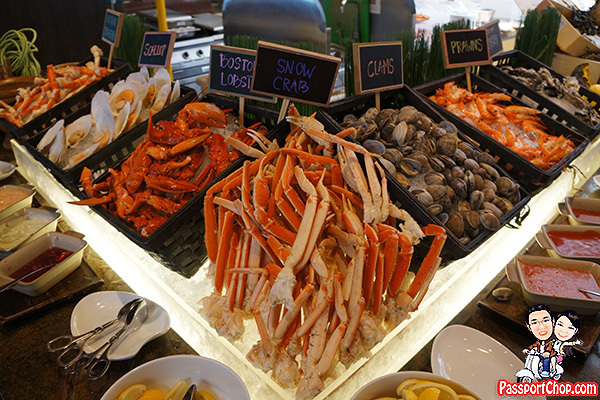 Pan Pacific’s sprawling Edge buffet restaurant has recently unveiled its new Sunday champagne brunch with a dizzying array of cuisines that span the globe. Feast on fresh ocean catch like Boston lobster, French and Canadian oysters, sashimi and sushi, followed by Italian and Spanish cured meats or aromatic Indian specialties.You can get Omi wagyu beef steak and signature Pan Pacific sausages grilled upon order or Thai mango salad freshly tossed by the chefs behind each ‘culinary theatre’. Signature seafood and meats items such as home-cured salmon gravlax and crispy kurobuta pork belly will be served at your table. Not one to wolf down your meal? This happens to be one of Singapore’s most leisurely brunches; the four-hour-long feast allows you to linger a little longer over your glass of Veuve Clicquot. The highlights for the Edge’s Sunday champagne brunch buffet include the “Live Grill” section where you can get Wagyu Beef and signature Pan Pacific sausages grilled on request. One must try is the pasta made a la minute – the duck confit ravioli. My only complaint for the ravioli is why so little?! – go for more servings – it is worth it but be prepared for a wait as it is also one of the most popular on-demand dishes at the Edge. 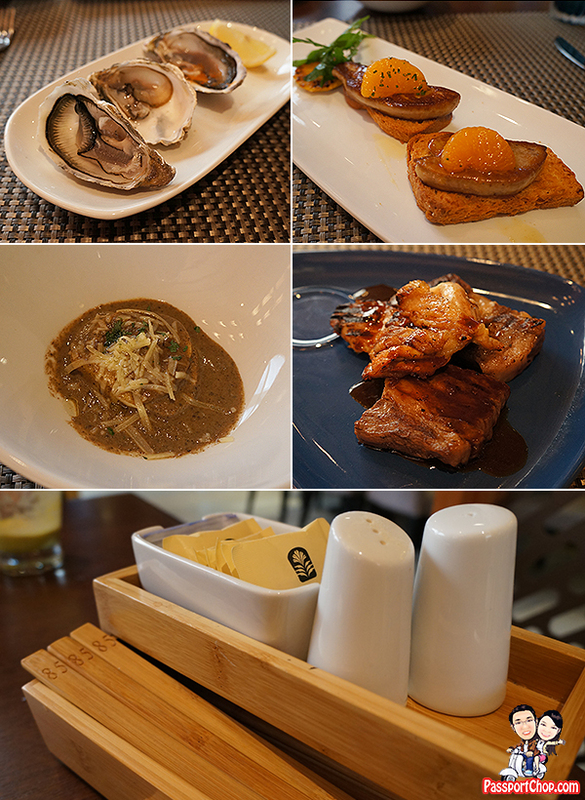 You must also not missed the pan seared foie gras also prepared a la minute by the chefs at the live cooking stations. The serving size of the pan seared foie gras is very generous – very big as you can see from the picture below – very tasty too. You don’t have to stand around to wait for these dishes to be prepared – at your table, there are a few chopstick-like sticks marked with your table number – just pass the chef one of these sticks and indicate your choice of food and it will be served on your table when it is ready. This frees up time for me to explore other parts of the Edge’s wide selection of brunch items! If you are a cheese lover, then you will definitely fall in love with the two-metre cheeseboard with its 30 varieties of artisanal Cheese and Raclette a la minute. Yes – 2-metre long and you will find all sorts of cheeses there. I am not a cheese connoisseur so I won’t be able to describe the variety but trust me, there is a lot there and the smells are just as interesting. 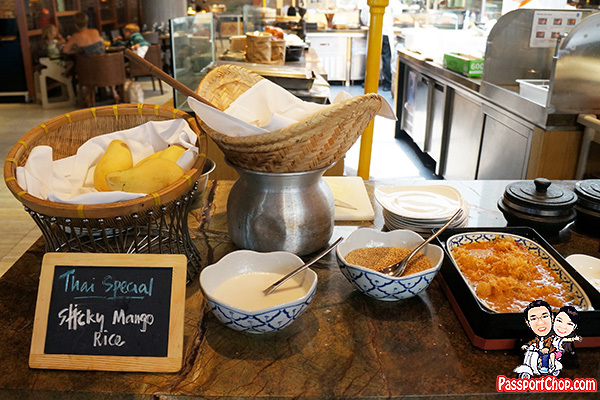 Strangely, of all the selection of food from different cuisines on offer at the Edge’s Sunday champagne brunch buffet, I still liked the local delights a lot – the laksa is one of the best laksa I have ever tried in Singapore! 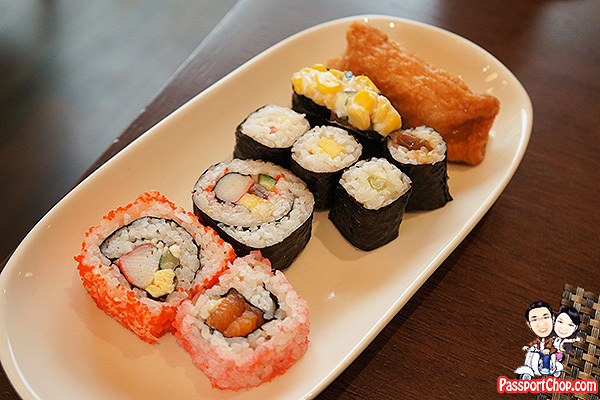 …to selection of Japanese sushi and sashimi. The Crustacean on Ice seafood selection is very tempting too – snow crab, boston lobster, scallops, clams, prawns and yes – you must try the oysters where there is 3 types of French and Canadian oysters. 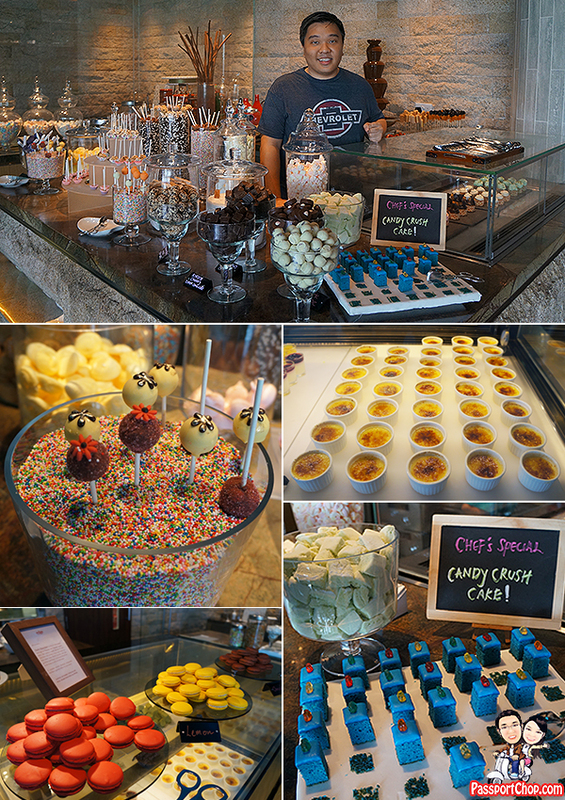 Finally the Dessert Station where you can take your pick from 20 different sweet treats, ranging from pralines to cake and a la minute crepes to waffles. This station comprises an elaborate presentation of 20 desserts including Candy Crush Sponge Cake (see the picture below and you know why it is called as such), Gluten-Free Red Velvet Cake and Chocolate Brownie. 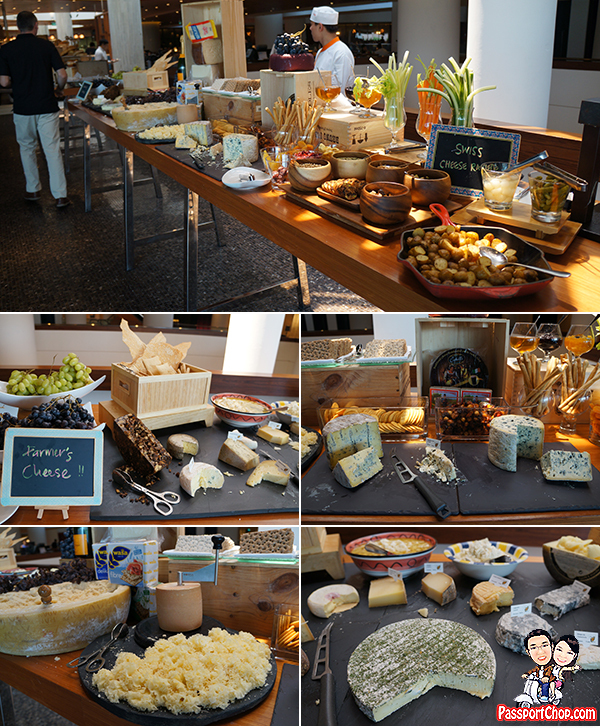 Pan Pacific Singapore’s Sunday Champagne Brunch buffet takes place every Sunday from 12 noon to 4pm at the Edge, Pan Pacific Hotel Level 3. To enjoy more value for your money, I strongly recommend you combine your Sunday champagne brunch dining experience with a staycation at Pan Pacific Singapore using the hotel’s Bed, Brunch and Bliss staycation package. As you can see in the package description below, you get to enjoy a one-night stay for two guests + Sunday champagne brunch for 2 adults (valued at $336++) for a total of $525++ – meaning you only need to top up an additional $189++ for a staycation at Pan Pacific Singapore’s Harbour Studio room! Valid for stays on Saturdays and bookings until 28 December 2014.